This will be the first in hopefully a line of lookbacks I will be doing related to our fav Hodgepodge err I mean Hedgehog. I also plan on hopefully getting some video content down the road for the site, mostly I’m waiting for YouTube to unlock their 60fps setting so you can see classics like Sonic Adventure 2: Battle and the recent Sonic Lost World in glorious 60fps, I’ve done some clever editing of 60fps recordings to blend them to 30fps showing a “fake” 60fps video (which I will show an example of below!). Also I want to address anyone that’s wondering if a 3rd Big Red Button research post will happen. The answer is actually yes, BUT I will wait for Sonic Boom’s release and compile the credits and then dig into it to get the info on who else worked on it. So for now it’s on hold until then. But for now, let’s get to the lookback! Why are you looking at this? This is crap! You may ask. Well to me, it is NOT! And I will explain hence the point of the lookback. For one thing, this is a pretty damn technically competent game, and what I mean by that is, this game first of all runs in a brisk 60fps not only in gameplay, but in ALL in-game cutscenes, just like in Sonic Adventure 2: Battle and Sonic Heroes. Second, it supports 480p and 16:9 widescreen, so it’s pretty nice even on an HDTV. Now I can’t speak for Sonic ’06 as I’ve (blissfully?) not played it, but I believe it is the ONLY Sonic game of last gen (Wii, 360, PS3) to run in 60fps all the way through and not in either certain parts or very unevenly throughout. Same goes for the cutscenes, Sega’s been pretty happy with always forcing cutscenes nowadays to run in 30fps only (this includes in Sonic Lost World to my disappointment), so this game really does do things later games by the main branch of Sonic Team don’t, think about that. Now to talk about the gameplay. For me, the gravity mechanic is honestly inferior to the air mechanic in the original, however, the Gravity Dive is pretty satisfying to use, as is the gravity turn technique when you do it right. The items to me don’t really matter much aside from giving you rings and gravity power. The special attacks mean nothing to me as they activate right away and you may not even be able to reach an opponent, also you don’t need it if you’re ahead. You can seemingly use these attacks to access shortcuts specific to a class, but I never get it to work right (likely just me) XD. Now the part most hate, the controls. To me, they’re JUST FINE! If you’ve played the original on GameCube no prob, then you’ll feel right at home with the GC controller here. On Wii U, you’re forced to use the Wiimote only seemingly (think you can use it on its side or vertically), I tried it on its side Mario Kart Wii/Excite Truck style and I actually had no real issue with it. Now for other bits, note that this does indeed include the late Deem Bristow’s voice clips from Sonic Adventure 2: Battle for Eggman. Mike Pollock does actually contribute new lines for the gravity moves which work. Also this is NOT the only game of the gen to use the original voice actors! You’re asking “What?! I’ve not heard such a thing, what are you referring to?”, well I’m referring to Mario & Sonic at the Olympic Winter Games on DS! That game features reused clips for Omochao and Big from Sonic Adventure 2 and Sonic Adventure/Sonic Heroes respectively (Omochao just says “Ciao” HA… and Big says, what else, “Froggyyyyyy”). So what about that video I promised? Why it’s below, footage I recorded of the game in the “fake 60fps” I mentioned. I recommend you download the video in 720p, and watch it in 1/2 the size on your offline player for the cleanest and smoothest viewing experience, in case your internet lags the framerate. Enjoy! So my views overall on the game? I think it’s very much worth playing. By the way, I’ve beaten the whole story. I actually like how the cutscenes feel very Sonic Adventure 2: Battle-esc, in some scenes like one with Jet, the scenes ends abruptly, just like in SA2B, so that made me smile as hey, anything that reminds me of that game is cool in my book. Speaking of 4kids, also consider this is the only full-fledged on the mark sequel to a pre-gen sonic game. I don’t put Sonic 4 in this category, that’s another story, but here the game has the same voice cast, the same structure, virtually the same everything, but it’s on a newer-gen console. And I actually really liked 4kids in this. Also Jason as Jet gets bonus points from me for sounding like Terrosaur from Beast Wars (who was voiced byDoug Parker), greatest show of all-time, you missed out big time if you didn’t watch it. I also next want to address the PS2 version, and sadly I can’t personally speak for it as I’ve sadly not tried it out. I really want to compare the two. I BELIEVE it lacks 16:9 (the back cover shows 4:3 screens and I don’t recall seeing footage in 16:9) and could also possibly run in 30fps as no footage I’ve seen hints at 60fps. I think I’ve heard it does support 480p, but again, I can’t confirm officially without having played it, gotta put that in my to-do list! 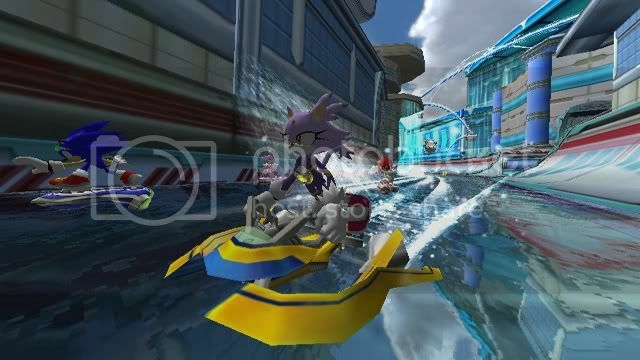 Also, I want to comment on Sonic Free Riders on Xbox 360, again I’ve not played (and I certainly don’t want to other than to see how it runs in person), I can’t believe how obviously low budget it looks, for one thing all cutscenes are in stills instead of in full-3D, also it seems to be more in a mission structure if I recall than purely racing, but it could be foggy memory on my part. Something tells me Sega was prepared due to it being a Xbox 360 Kinect exclusive (personally, I think this was a really strange and bad idea) so they didn’t spend as much as they would’ve like in the previous two games, saving on the cutscene work certainly helped them. Also, ever notice how first, Rumblebee seemingly was absent in Free Riders, second, he was actually the singer also in Sonic and the Secret Rings, AND was the announcer in all of the Mario & Sonic games? Wow, kinda fond of Nintendo ain’t he? Also, did you know that the developers Xeen and O-TWO also worked on Sonic Unleashed Wii and PS2? Dimps only did daytime stage design work in that. I heard once the game did use the Zero Gravity engine, this pretty much confirms it! I have more to say, but perhaps I’ll save that for the future wink wink nudge nudge. Anyway, if I had to give a score, I say it’s at least a solid 8 out of 10, but it’s just my opinion because I love what it accomplished and think it was a really solid game under any rough spots reviewers said of it. If you’re lucky, you can still find it in the $20-$30 range, sadly it’s the ONE Wii standalone Sonic game that isn’t everywhere still, so you might have some trouble findng it at least brand-new. So there you have it! I hope this was an entertaining read for you all, and I hope to have more for you later on down the road. One has to wonder why, when Sonic Riders pretty much tanked, Sonic Team thought it was worth making a sequel. Much like the original game, players must ride around intricate courses using custom hoverboards called Extreme Gear. There are plenty of gimmicks within each stage to take advantage of in order to take the lead, but one of your own techniques is to control gravity, allowing you to corner effectively and even take alternative paths on walls or ceilings. 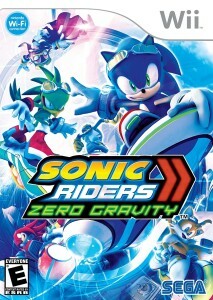 Sega Europe have added a release date to their official websites game page for Sonic Riders Zero Gravity on Wii and PS2. The game is listed for release on Friday 22nd February this month, the date Sega Europe released in their Q1 schedule so it looks to still be on track. Good old ArchangelUK over at Sega Europe has released some early Christmas presents to fans on the official European Sonic City website. ArchangelUK has also managed to get a Sonic City EXCLUSIVE. The main theme to Sega Superstars Tennis is now available on Sonic FM for your listening pleasure. Congratulations ArchangelUK! Stay tuned to Sonic News for further updates as they happen! IGN updated their Media section of ‘Sonic Riders: Zero Gravity’ earlier today with a brand spanking new trailer showcasing some new tricks such as Gravity Dive (which looks similar to how Chaos Control worked in Shadow the Hedgehog) and some flashy never before seen gameplay footage. You can view the new trailer at IGN’s media page for the game here or at Nintendo Wii Fanboy courtesy of Joystiq here. The release date is still set for next January in the US and March 08 for Europe. Hopefully it will improve on what the first game had to offer with its tonne of extra gears and courses. IGN have updated their ‘Sonic Riders 2’ media section today with a new trailer showing off some brand new in-game footage, CG movie scenes and an updated (or simply remixed) theme song. The English Playstation 2 magazine PLAY have featured a Sonic Riders: Zero Gravity article in the September issue of the magazine! The article divulges several details, not least of all the fact that Jet the Hawk (Of original Sonic Riders fame) is set to return alongside a few more new yet currently unrevealed characters.